The Mini Mag-Lite M2A will show off your Full-color Company Logo. This smooth barrel was just developed for MagLite® flashlights in 2018. New! 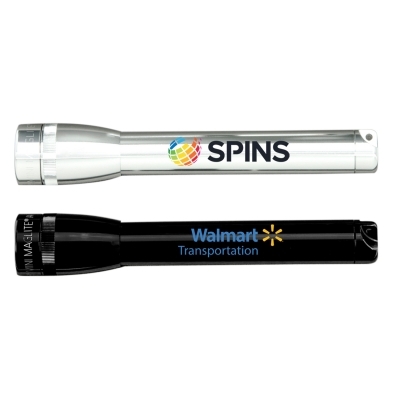 Full Color Digital Imprint on a smooth barrel! The smooth barrel assures a precise appearance to your color imprint. Pricing Includes: Full color printing using four-color process colors (cyan, magenta, yellow and black) on barrel. Additional art charges will apply to convert colors from spot to cmyk. Exact PMS matches are not possible. Neon and metallic inks are not available. THE WORLD FAMOUS AA MINI MAGLITE®. 5 3/4" in length. Comes with 2 "AA" batteries and packaged in a black presentation box. The flashlight that changed an industry. Never before has such a powerful beam come from such a small flashlight. It shines up to 70 times brighter than flashlights with comparable battery resources.The 5 3/4" "AA" Mini Mag-Lite® fastfocus beam adjusts from spot to flood with the turn of the head. Additional Location Engraving: $02.80 (G) running charge, per item, for additional engraving location on opposite side of barrel, plus another setup charge.